UMKA CARDBOARD MILL PART OF THE GLOBAL INITIATIVE WORLD CLEANUP DAY – Umka Cardboard Mill d.o.o. Umka Cardboard Mill, Papirservis FHB and Ekostar Pak were part of the largest global environmental initiative “World Cleanup Day” held on 15 September 2018 in 144 countries worldwide. The movement “Let’s Do It” which was established in 2008 in Estonia, the driving force behind this global clean-up initiative, reached a record of 13 million volunteers this year, whereby the “World Cleanup Day 2018” officially became the largest civic initiative in the history of our planet. 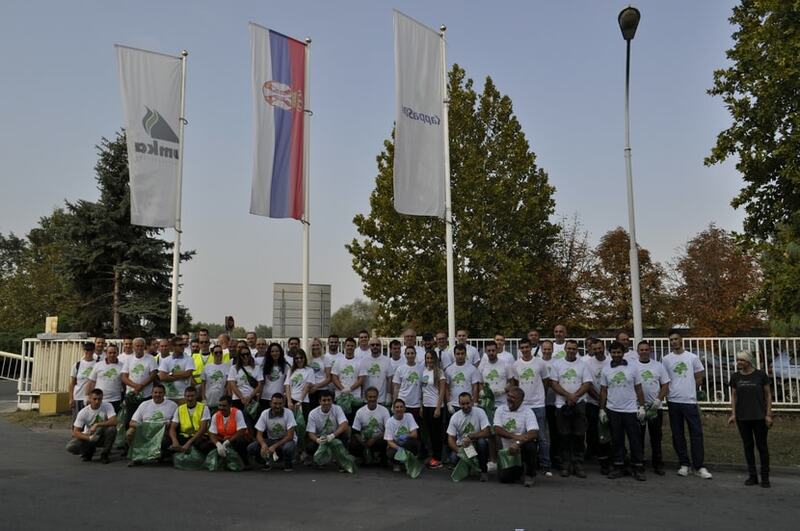 The employees of Umka Cardboard Mill who responded to the invitation to join the clean-up initiative as volunteers, with the support of their colleagues from Papirservis FHB and Ekostar Pak, cleaned the Sava riverbank in the factory’s surrounding areas in 3 hours. They collected 240 kg of municipal waste, 220 kg of glass, 175 kg of scrap paper and plastic for recycling. The company for packaging waste management, Ekostar Pak, founded by Umka Cardboard Mill, is a partner on the project “Let’s Do It Serbia” and it provided T-shirts and protective gloves for all volunteers across Serbia. On Saturday, 15 September, waste was collected at as many as 50 locations in Serbia, with participation of around 1,500 volunteers, who collected more than 20 tonnes of waste according to the organizer’s estimates. The purpose of the global “World Cleanup Day” initiative is to indicate the importance of responsible waste management and the damage that waste can cause to the environment. As a leader in recycling with 120,000 tonnes of processed scrap paper per year, Umka Cardboard Mill contributes to environmental protection, and by participating in the initiative, our employees wanted to set a positive example and contribute to raising environmental awareness of the citizens. They were also supported in that endeavour by the Association “Walking By The Earth” which organised the clean-up initiative in Umka, with participation of the volunteers from the Special Needs School “Sveti Sava”. In cooperation with Papirservis FHB, all proceeds collected from the sale of recyclable waste in the initiative of this Association will be donated to the Special Needs School.